The Boston Celtics [ sɛltɪks ] are a Boston-based basketball team in the American professional league NBA. You are a total of 17 titles won to date, the most successful franchise in the NBA. The Celtics are due to these successes, such as the New York Yankees in baseball, the Fighting Irish of the University of Notre Dame in college football and the Dallas Cowboys in football as " America's Team". These teams are very popular all over the USA and have a large following. Established were the Boston Celtics in 1946 by Walter A. Brown, the former operator of the stadium Boston Garden, which (now TD Garden ) served as the venue for the inauguration of the Fleet Center until 1995. The Celtics are one of the three still existing original members of the NBA and also in addition to the New York Knicks, the oldest team, which is based in his original hometown today. 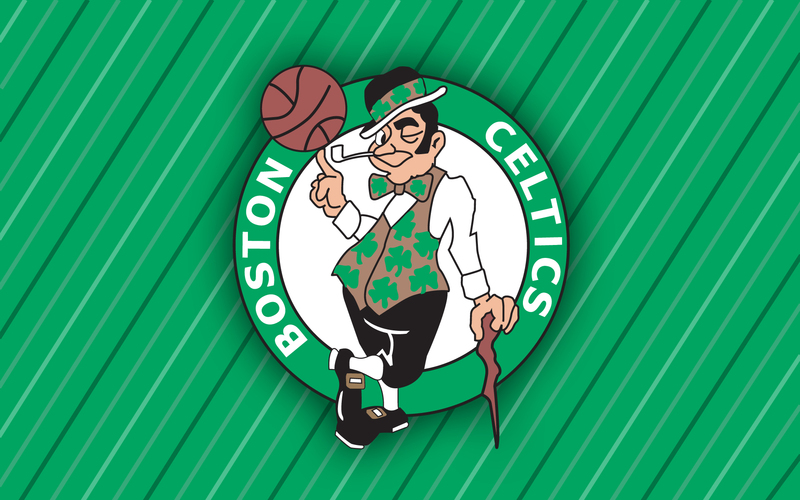 The name Celtics was inspired by a New York professional basketball team, the Original Celtics, from the 1920s and finally was able to prevail against proposals such as Whirlwinds, Unicorns and Olympics. These is especially the time from 1957 to 1969, in the title alone 11 were won, including eight in a row. 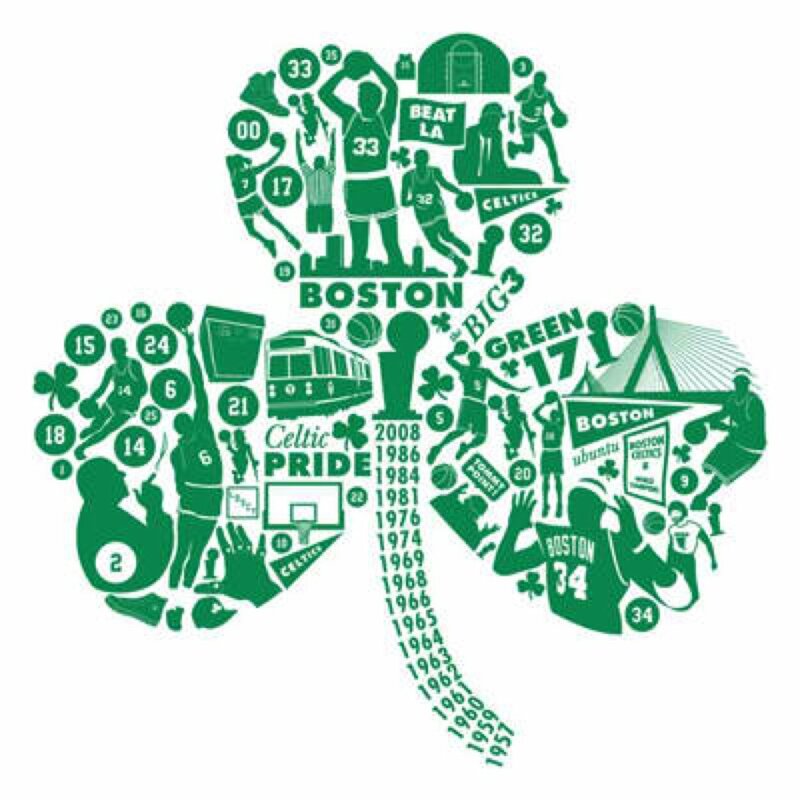 This time is today mainly associated with Red Auerbach, the name of the former coach, whose brother Zang designed the famous logo of the Basketball circling Irish. The second great era of Celtics were the 1980s. Although only three more titles were brought, so this time was influenced mainly by the duels with the Lakers and the top players Larry Bird on the part of the Celtics and Magic Johnson with the Lakers. Since that time it had become rather quiet around the Boston Celtics, as significant sporting successes have since been failed. This is associated with cardiac death of Reggie Lewis. The successor to Larry Bird as team captain and franchise player broke together in 1993 during the first-round playoff game against the Charlotte Hornets and died a few weeks later after a second collapse. The best finish since the era Bird remained therefore to participate in the Eastern Conference finals in 2002. After another disappointing season, the management decided before the season 2007 / 08, at the urging of superstar Paul Pierce, for the " quick success ". First, Ray Allen was brought from the Seattle SuperSonics to Boston, then Kevin Garnett was traded for five players from Minnesota. With the trio of Allen- Pierce - Garnett (nicknamed The Big Three ), which is undoubtedly one of the best teams in the NBA, the Celtics were the first time in many years a serious title contender. This has been illustrated among other things by the fact that the Celtics in the 2007/ 08 season could qualify as the first of all the teams for the playoffs. By 131:92 victory in Game 6 of the NBA Finals in 2008 against the Los Angeles Lakers, the eternal rival the Celtics to the NBA crown in the 1980s, was able to win an NBA championship basketball team the Boston for the first time since 1986. In the 2008 /09 NBA season, the Celtics have won 19 consecutive games, which is a team record for them. This long winning streak was calculated from the final opponents the previous season, the Lakers finished. On 27 February 2009, the Celtics announced that they have recently released by the New York Knicks point guard Stephon Marbury committed. They reached the playoffs in 2009, the semifinals in the east, where they were eliminated by eventual finalists Orlando Magic after the seventh game. In the following season, the Celtics again reached the Finals, where they lost this time against the Lakers in seven games. At the beginning of the 2010/11 season, the Celtics reinforced during the free agency period with the two former All-Stars Jermaine O'Neal and Shaquille O'Neal. After a good season and the resulting qualification for the playoffs, eliminated the Celtics in the second playoff round with 1:4 against the Miami Heat at the stars LeBron James, Dwyane Wade and Chris Bosh out. Shaquille O'Neal finished after his career. The next season began badly for the Celtics. You could show only a balanced balance sheet to the All- Star game. They finished the season with a strong final spurt and could thereby secure the fourth place in the Eastern Conference. In the Conference Finals, they were subject to the eventual champions Miami Heat 3:4. As one of the main reasons for the boom end of the season is considered the fact that Kevin Garnett has since been used mainly as a center. For the season 2012/13 Ray Allen left the Celtics in the direction of Miami Heat. For this purpose was signed Jason Terry of the Dallas Mavericks. In addition, Courtney Lee was taken by sign- and-trade by the Houston Rockets. On January 25, 2013 retired with Rajon Rondo one of the key players of the Celtics in the game against the Atlanta Hawks to a torn ACL and fell for the rest of the season. However, the Celtics reached despite the failure of the playoffs. There, they lost in the first round of the New York Knicks with 2:4. After the season, the longtime head coach Doc Rivers left the Celtics and changed by trade to the Los Angeles Clippers. As a consequence a trade has been agreed on 27 June 2013 with Brooklyn Nets that Garnett, Pierce and Terry sent to Brooklyn and means to rebuild the Celtics. New head coach of the Celtics was Brad Stevens, who previously served as head coach for the team Butler University. He received a contract for six years in Boston. The rivalry between the Boston Celtics and the Los Angeles Lakers open up the two most historic franchises in the history of the NBA. Both teams met 12 times in the final series of the NBA, beginning with the first meeting in 1959. This number of duels in Final Series represents today the record for most duels between two teams in the NBA finals series represents the Celtics and the Lakers dominated the NBA in the 1960s and 1980s. In the 1960s, they met up 6 times in the NBA Finals in the 1980s, 3 times. After the formative figures of the 1980s, Magic Johnson and Larry Bird, their careers ended, the rivalry was treated less intensively by the year 2008. In 2008, the Celtics and the Lakers met after 1987 again in the Finals of the NBA. The Celtics were the duel and so won their 17th championship. The Lakers took advantage of the opportunity for revenge in 2010, beating the Celtics after 7 games. Both teams have jointly won 33 championships, nearly half of the 67 played out in the NBA title. The Celtics claim 17 championships for himself, the Lakers won the title 16 times. The Boston Celtics and Philadelphia 76ers met in the playoffs in the NBA each other 19 times. No other meeting of two teams, there has been until now in this number. After 12 of 19 meetings were able to reach the next round or even win the title the Celtics. Reached its climax in the rivalry in the period between 1965 and 1968. Decisive factor here was the duels between Bill Russell and Wilt Chamberlain. The loss to Philadelphia in the finals of the 1967/68 season prevented the ninth championship in a row. During the early 1980s fought both teams, each led by Larry Bird and Julius Erving, for years to Conference Championships. The rivalry between the Celtics and the Detroit Pistons culminated in the late 1980s. Involved were particularly players like Larry Bird, Kevin McHale, Robert Parish, Isiah Thomas, Bill Laimbeer, Dennis Rodman and Joe Dumars. In seven seasons 1985-1991, the two counterparties met 5 times in the playoffs. 2 duels were won by the Celtics, the Pistons won in 3 cases. Of all NBA teams, the Boston Celtics have withdrawn most jersey numbers.